My apologies for the lack of recipes lately. I have been busy doing some camping, enjoying the wonderful summer sun, sipping cocktails, and neglecting my internet duties. 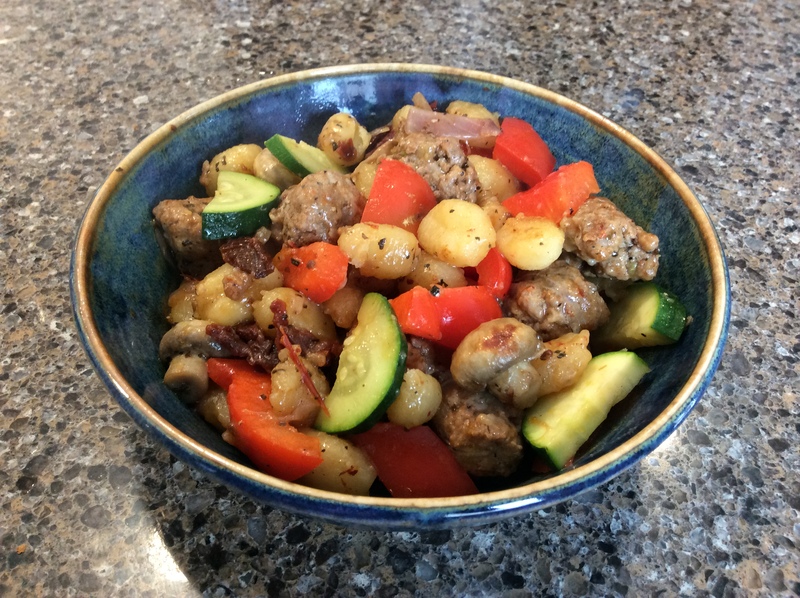 So here’s a quick skillet recipe for you. I threw this together one evening because I had some gnocchi burning a hole in my cupboard. Add sausage and onion, cook until sausage starts to brown. In the meantime, heat a second pan. Use to fry gnocchi in butter and oil until they are golden. Add mushrooms to sausage and onion and cook until mushrooms start to brown. Add sundried tomatoes and garlic, saute for a few minutes. Add red peppers, basil, salt and pepper. Saute for a few minutes. Add zucchini and cook. At this point, if you would like to speed things up and soften the vegetables, add 2 tbsp of water, cover and steam until vegetables are soft. Once everything is cooked to your liking, add gnocchi and mix well. Turn off heat and serve. I love rhubarb. Not on it’s own of course, no one can handle that bitterness. But when it’s doused in sugar, it’s delightful! I also appreciate that rhubarb is one of the first things to pop out of the ground come spring. My nana gave John and I a ruby red rhubarb plant from her garden. We transplanted it a couple of years ago, and this year it has finally taken off and is ripe for harvest. 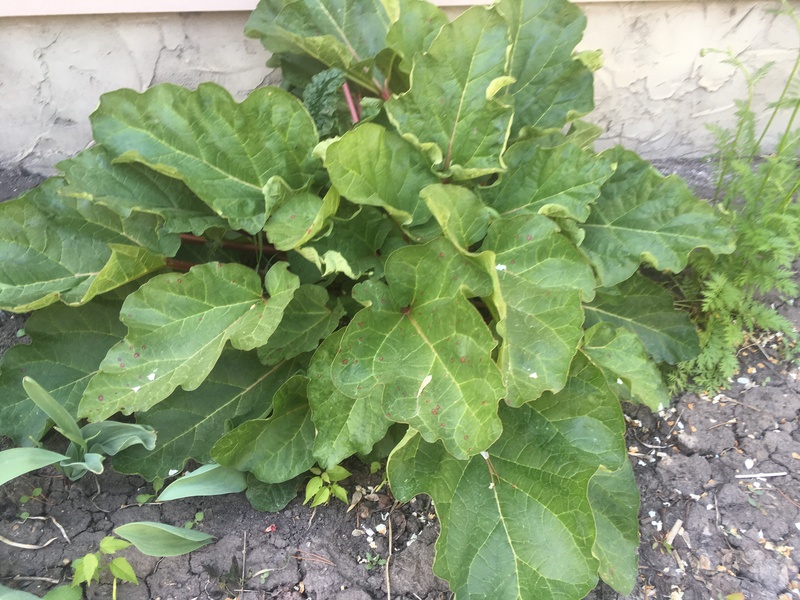 I planted our rhubarb plant right in the middle of my flower bed in the front yard. My understanding is that the ruby red variety doesn’t get as big as some of the other rhubarb plants, so I am hoping it doesn’t take over my garden. 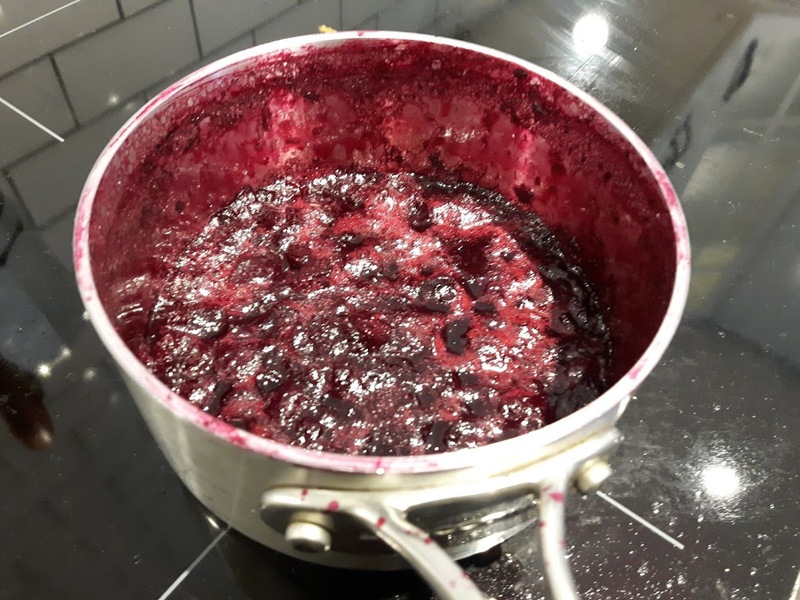 So last week, I harvested my plant for the first time and made one of our favourites, a blueberry rhubarb compote. This sauce is great. We primarily use it for breakfast or dessert. 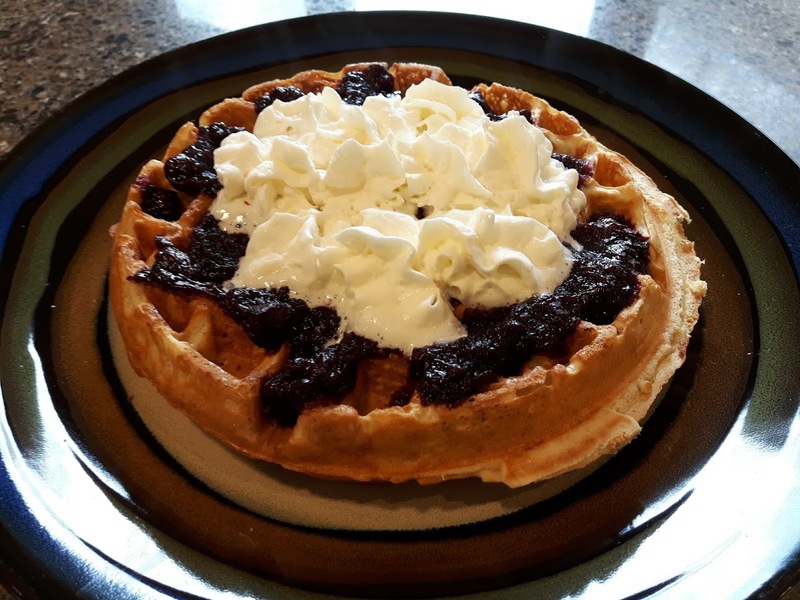 It goes great on pancakes or waffles in the morning, and on ice cream or yogurt in the evening, if you want something sweet that’s a little lighter. The sauce is easy to make in the morning and freezes well if you have any leftover. John and I will also freeze pre-chopped rhubarb and use it throughout the year for this sauce. This is a great way to use some of your bountiful rhubarb crop! Place all ingredients in small/medium pot, turn heat to high. Bring ingredients to a boil. Reduce heat to medium high. Allow to cook down for 5-10 minutes, stirring frequently. Turn heat off and sauce will thicken. 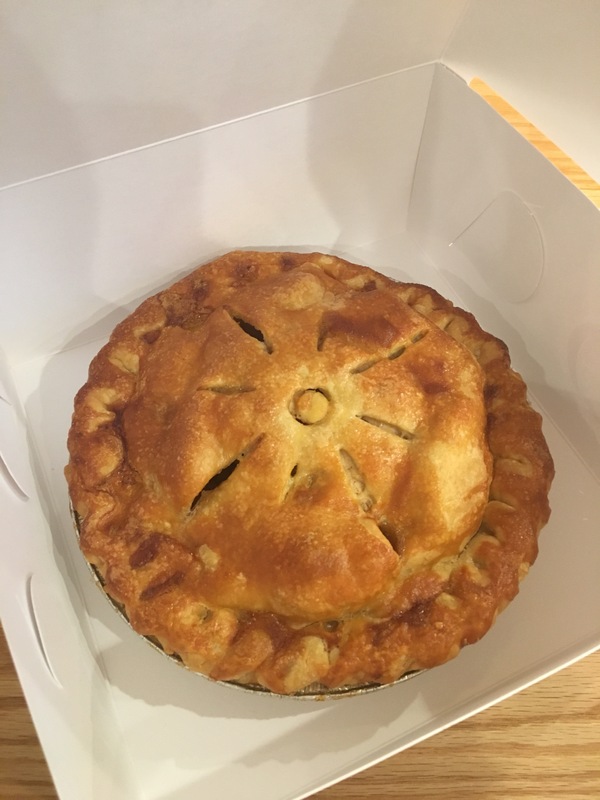 As mentioned in my last post, my friend Micheline and I were fortunate enough to take a pie making class through Edmonton’s beloved Duchess Bakery. 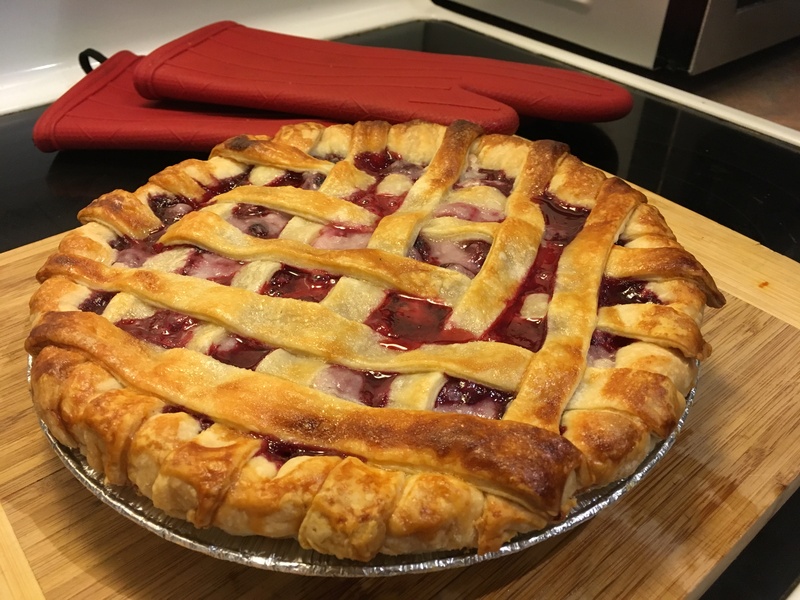 During our class, we made apple pie, banana cream pie, butter tarts, pie dough and my favourite – sour cream cherry pie. It was a very productive few hours! One of our instructors, Sharileen, is the genius responsible for this wonderful pie recipe. Like many Albertans, she grew up with a sour cherry tree in her yard. She wanted to find something to do with the sour cherries and came up with this recipe, changing the lives of Edmontonians for the better. The sour cherry pie filling is a shockingly simple 4 ingredients: Sour cherries, sour cream, flour and sugar. One thing that was kind of fun about this pie was that we did a lattice top. It looks pretty complicated but is very easy. Roll out your dough approx. the size and shape of a pie top and cut into strips (a pizza cutter works nicely.) 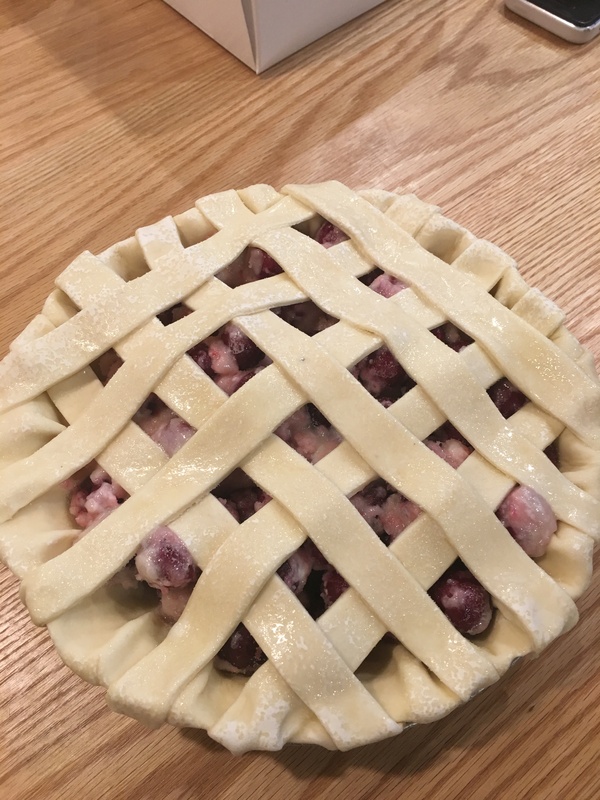 Simply place each strip on top of the pie to create the lattice as you like, no need to weave them together all fancy-like, just keep it simple! Before baking the pie, be sure to brush the crust with an egg-white/cream mixture, and sprinkle with white sugar. The egg whites will make the pie crust shine and the cream will help it brown nicely. As for the sour cherries, they are definitely seasonal. If you have access to a sour cherry tree, then you are in the money! If not, Edmontonians can go to Duchess Provisions (the branch of the bakery that sells baking tools and products) and purchase the cherries frozen. They sell them in exact portions to make this pie. To get the dough on the pan, fold rolled dough in half before sliding the pan underneath. Once dough is placed on pan, use a kitchen scissors to cut hanging dough around the perimeter of the pie pan, leaving about 1 inch overhang. When sealing the edges of the pie, fold excess overhung dough underneath itself so it just comes over the edge of the pie pan. Before baking, brush pie with an egg white – cream mixture, and sprinkle with white sugar. THIS IS KEY! 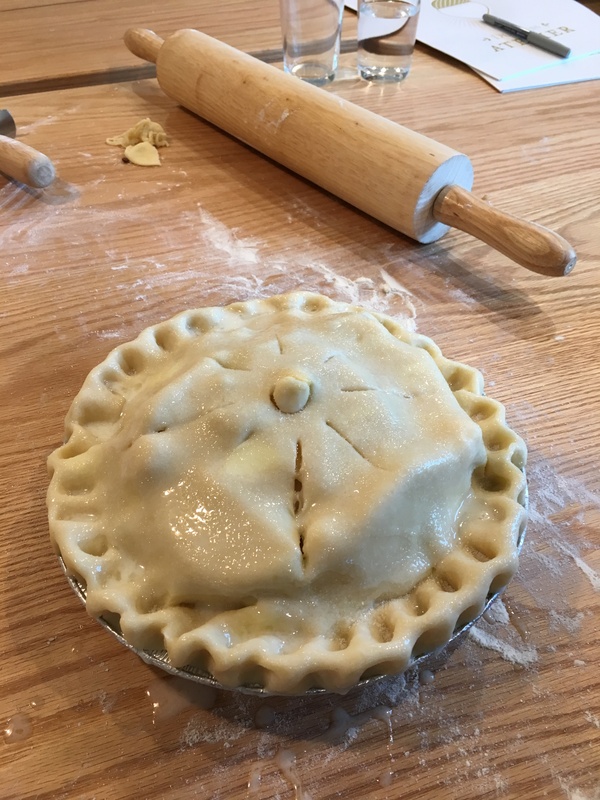 If you are interested in Giselle’s dough recipe for you pie, click here. This pie is insanely good. Like pure insanity. Special thanks to Giselle and Sharileen for hosting such a fun class and sharing all their great pie-making knowledge with us. In a round crust covered cherry filled world, these women are gods! In a medium bowl, mix together the cherries, sugar, and flour. Add the sour cream and stir until all ingredients are combined. If your cherries are really juicy and look a bit watery, stir in another 2 tsp flour. Bake for 70-75 minutes, until the top is golden brown and the filling is bubbling and thickened. Allow the pie to cool completely before serving. This pie will keep at room temperature for up to 3 days. Additionally, our super-hip selfie Prime Minister Justin Trudeau ate there once. Anyways, the bakery is just incredible. During a visit, you will find it packed with patrons, usually lining up to buy their amazing macarons. However, my favourite thing that they make is the pie. Duchess Bake Shop recently opened up a new portion of the business dedicated to baking classes, Duchess Provisions. 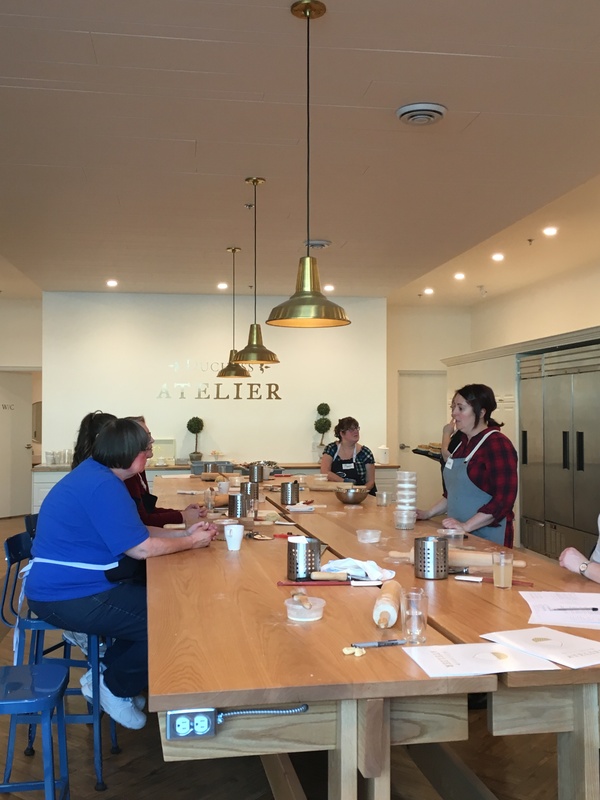 You can take all different types of baking classes including how to make their delectable macarons, but my friend Micheline and I managed to score two spots in their pie making class! We were very excited to learn the secret to Duchess’ fabulous pies. And the class did not disappoint. The class was taught by owner Giselle and her long-time employee Sherilynn. Giselle talked about how her co-owner Jake is this incredible pasty chef, but when she first met him he didn’t know how to make a pie. The home-trained Giselle is the pie expert. The two of them put their skills together to create the most popular bakery In town. Pies are just my cup of tea. They are rustic, less fussy and more forgiving then a lot of other types of baking. Although you can definitely take some steps to make your pies top notch, they are pretty hard to screw up. We started out by making a classic apple pie (pictured.) We used the hard and less sweet Granny Smith apples, which Micheline peeled and I sliced. We let the apples sit and get juicy, but not too runny. Micheline rolled out our pre-made dough. A nice trick they showed us was to fold the rolled out dough in half before sliding the pie plate under it and spreading it across the plate. It made this whole task much easier. After adding the filling and making the top, we brushed the surface with an egg-white and cream mixture, then sprinkled with white sugar. The egg whites help make the pie crust nice and shiny while the cream helps it to brown. It’s amazing how nicely it works! They put our apple pies in their impressive row of ovens and as the class moved on, we were treated to the aroma of half a dozen apple pies baking at once. The dough was pre-made for us when we did our pies to speed up the class, however we made some fresh dough to take home. This will be today’s recipe. Now I typically just use Tenderflake for my pie crusts, so I was curious to see how Duchess makes their crust. I was amazed that their recipe was even easier then Tenderflake. Giselle explained to us that pie crust is really fat, flour and water. The most important part is to select the fat. She said you can use animal fat, like that of chicken, which will make the crust flavourful, but far too greasy. She said you can use butter, which has a lot of flavour but makes the crust a little heavier. Shortening gives you a very light and flakey crust, but offers no flavour. She said her preferred method is to use ½ butter ½ shortening. We made our crust and each took a little bit home. I still have mine in my freezer, as pie crust freezes just great. Make in advance and freeze if you have to. You can make it in a stand mixer with the proper attachment, or use a pastry cutter and knead by hand. If you are doing it by hand, cut your butter into very small pieces as this will make the whole thing much easier. Once dough is placed in pan, use a kitchen knife to cut dough around the perimeter of the pie pan, leaving about 1 inch overhand. When sealing the pie, fold excess dough underneath so it just comes over the edge of the pie pan. Before baking, brush pie with an egg white – cream mixture, and sprinkle with white sugar. Our pie class was so fun and interesting. Stay tuned for my next post where I will share my favourite Duchess pie recipe with you – sour cherry cream pie. 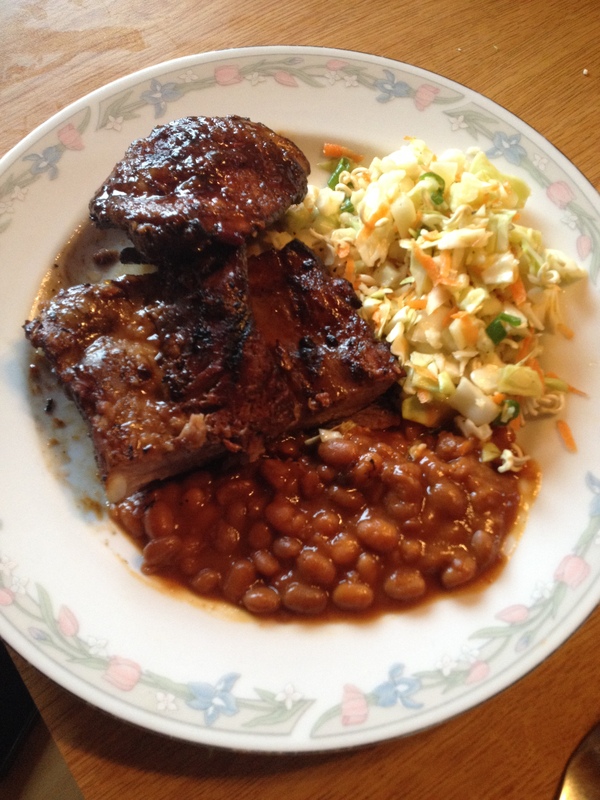 Thanks to Giselle for allowing me to share her recipe with you! Good news! Giselle has released a Duchess Bake Shop cookbook feature some of the best recipes from the bakery. Click here for more information. or 1 covered or lattice-top pie plus extra pie shell. Place the flour, butter, shortening, and salt into a stand mixer bowl. Mix on low speed until the fats are in small chunks and the mixture looks a bit dry. This should only take 10-15 seconds. If you overmix you run the risk of turning your mixture into a dough, and then you’ll have a difficult time incorporating all the water in the next step. Shape the dough into three balls. Wrap each ball in plastic wrap and refrigerate for at least 30 minute, making sure the dough is fully chilled before rolling out. At this point the dough can be frozen. Let it thaw completely before using it , but when you roll it out, be sure it’s still cold. Pie dough can be stored in the refrigerator for up to two days, or in the freezer for up to six months. I apologize for the lack of recipes lately. John and I have been renovating our house over the last couple of months and my kitchen situation has not been conducive to cooking. I have a stove that is sometimes plugged in, a refrigerator that migrates around the floor, a sink in the basement, several cardboard boxes of kitchen utensils in a spare bedroom, and construction supplies all over. However, thanks to the magic of the microwave, re-heating is a different story! As a result, I have been borrowing my mom’s kitchen to do some batch cooking. Typically, I will emerge with a crock-pot meal and several containers full of something to freeze. So for today’s edition, I thought I would go through my archives and share some of my favourite batch cooking/freezer friendly recipes that I have posted in the past. The good news, is that thanks to the hard work of my husband, my kitchen should be up and running very soon. Once I get organized and hit my cooking groove again, stay tuned for some new recipes! I gotta say I love the flavours of Moroccan cooking. Cumin, cinnamon and turmeric are such a nice combination. I had some ground turkey and wanted to make some sort of quick and healthy skillet dish. 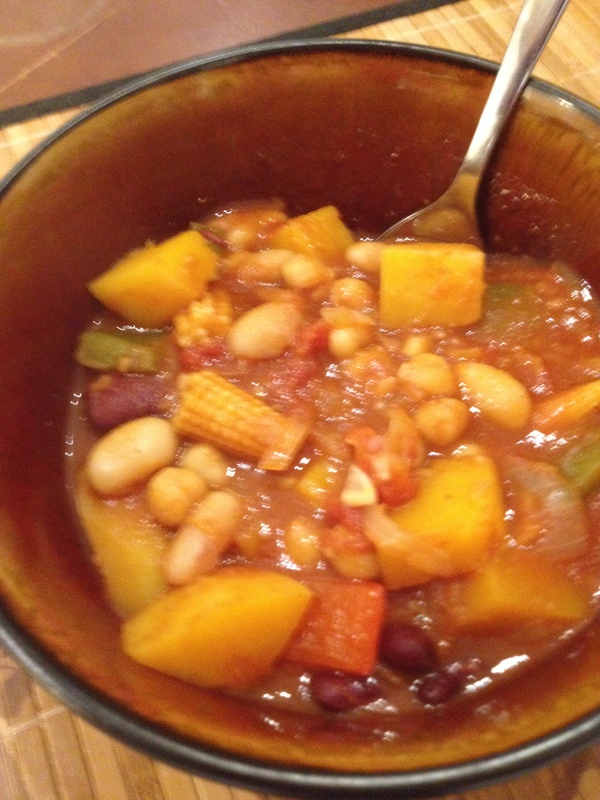 With a little googling for ideas combined with what I had in the fridge and pantry, this is the dish I came up with. I figure if a dish can satisfy all three criteria of quick, healthy and delicious, then you’re doing okay in life. I must say, this skillet dish does indeed satisfy all three of those criteria! So satisfy your hunger without feeling guilty! In large skillet, heat oil. Season turkey with salt and pepper. Brown turkey until cooked. Set aside turkey. Cook onions for about 2 minutes. Add garlic, carrots and sweet potatoes and cook for 3-5 minutes, until they start to soften. Add spices (cumin, coriander, turmeric, cinnamon, red pepper flakes) and stir for about 30 seconds. Add turkey and stir. Add chicken broth, raisins, tomato paste, lemon zest, salt and pepper to taste. Mix well. Garnish with cilantro and serve on couscous. Boil 1.5 cups water. With ¼ tsp salt, pour over couscous. Cover and let sit for about 10 minutes. 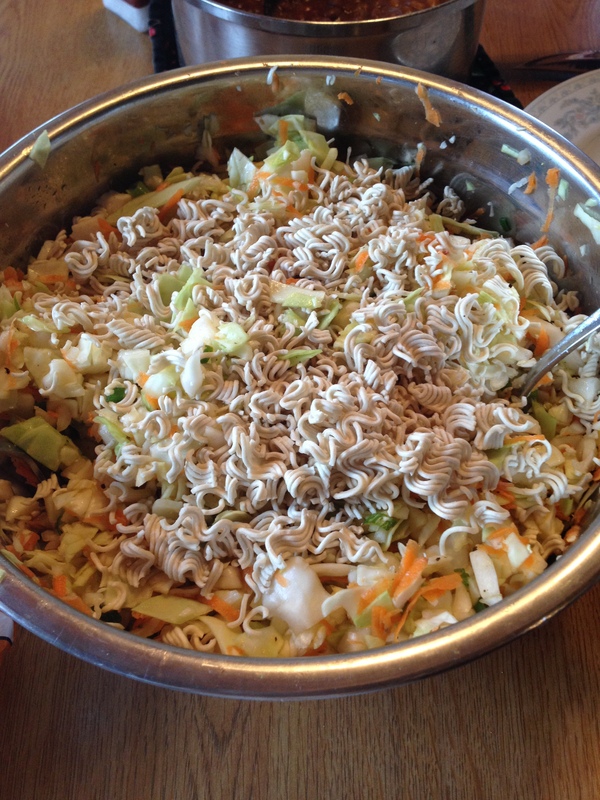 Fluff with a fork before serving. John and I made a marvellous discovery … next to the roasted chicken, Safeway sells cooked ham. With the delicious maple scent overpowering the chicken it was sitting next too, John and I had to grab one for dinner. It was a pretty big hunk of meat, too much for two people, so I took the leftover ham, wrapped it in foil and threw it in a freezer. A couple weeks later, I needed a quick dinner. So with my precious ham in mind, I pre-cooked some barley the night before in preparation for a quick skillet dish the next day. 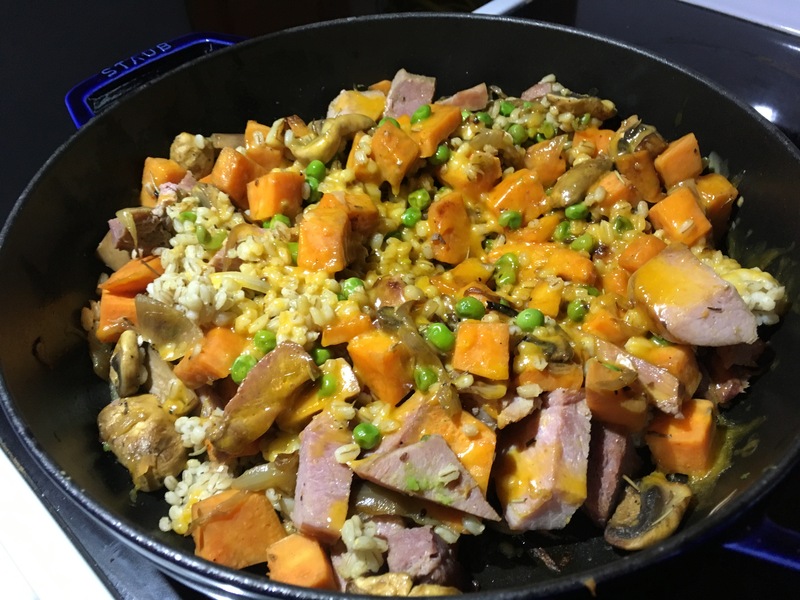 Inspired by what I had hanging around in my fridge, sweet potatoes, peas, barley ham and cheddar cheese came together in a quick and delicious dish. So next time you have some leftover ham, this is a great way to use it up for a quick and delicious dinner. Add sweet potatoes. Cook for about 5 minutes. Add mushrooms, garlic and rosemary. Season with salt and pepper to taste. Cook until sweet potatoes are nearly cooked. Add ham and peas and cook for about 3 minutes. Add barely and cook until barley is heated. Sprinkle grated cheese on top. Cover and cook until cheese is melted. Often, my friend Jackie comes over for dinner, and when she asks what she can bring, my answer is usually wine or salad, depending on my stock of wine or salad. Whereas I am typically stuck in a salad rut (lettuce/spinach, tomato, cucumber, avocado and dressing) Jackie always brings something different and creative. Last time was no exception. She found a Jamie Oliver recipe for a fresh, colourful salad, featuring greens, beets, zucchini and carrot, all chopped in a food processor. The dressing is made with fresh tarragon and greek yogurt, a little bit creamy but not too rich. Given all the beautiful colours in the salad, and the fact that it was delicious, I thought that this week I would share this Jamie Oliver salad recipe with you! Thanks to Jackie for a great salad and a lovely evening! To make the salad dressing add all ingredients together into a blender. Whiz until combined. Have a taste – you want the salt and acid to be slightly over the top, so adjust if needed and whiz again. Pour into small pitcher and take to table. Wash and trim the zucchini and carrots. Quickly peel the beets. Using the course grater attachment, grate the vegetables one at a time, all in a food processor. 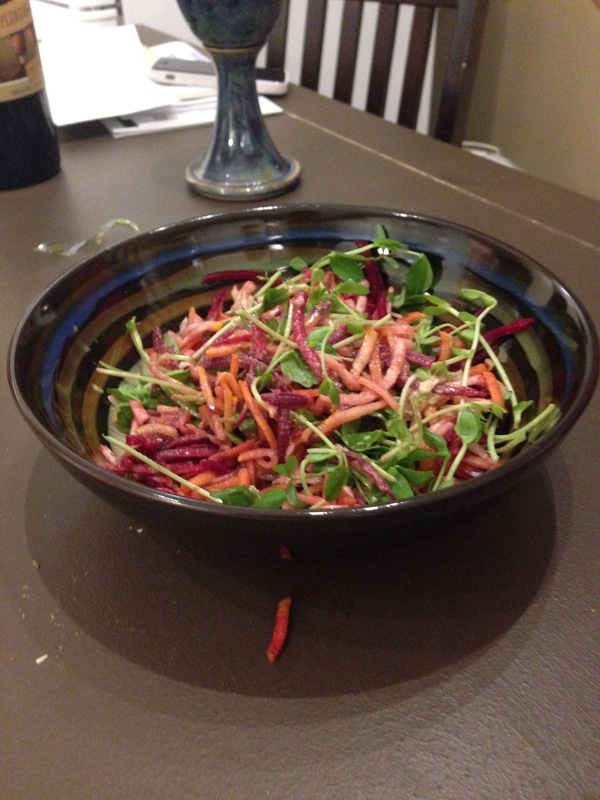 Tip out onto a platter or salad bowl so it looks like a rainbow and scatter pea shoots over the top. Dress at the last minute when about to eat. Happy new year to all! To celebrate, I have assembled a list of my favourite posts of 2016. Some make the list because they have an interesting story, and others because they are simply an awesome recipe. Enjoy the tasty memories! 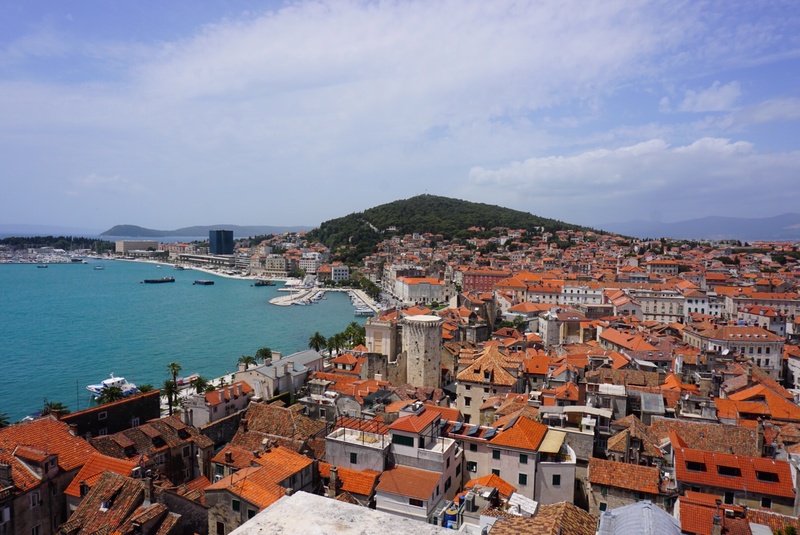 For our honeymoon, John and I visited Europe and traveled to Barcelona, Italy and Croatia. I did 5 posts in this series and had a hard time picking a favourite. But in the end, the leg in Croatia will always hold a special place in my heart, and therefore top spot on this list! No best of list could be complete without one of John’s recipes. 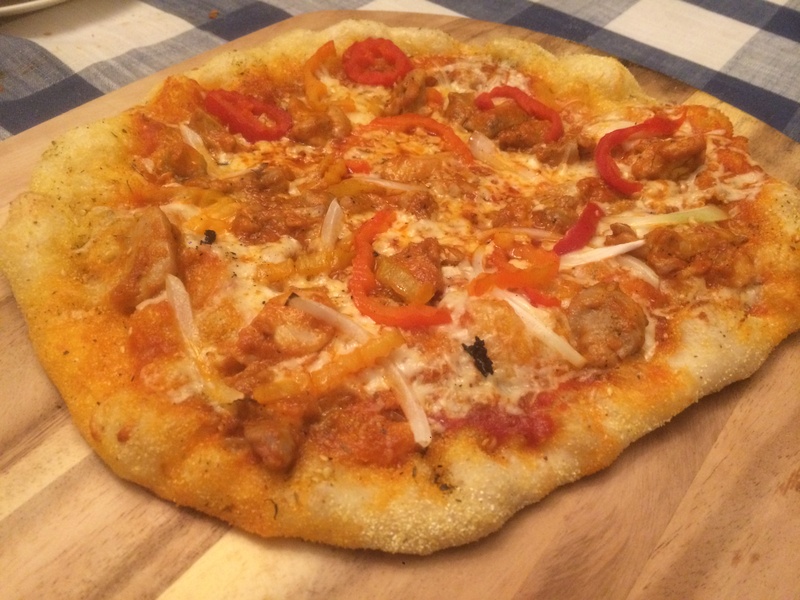 This buffalo chicken pizza is a household favourite and a crowd pleaser everytime. Be sure to use John’s Buffalo Sauce Recipe (one of my favs from 2015) for this pizza and other buffalo sauce needs. If I had a hundred brownies I’d eat them all at once! 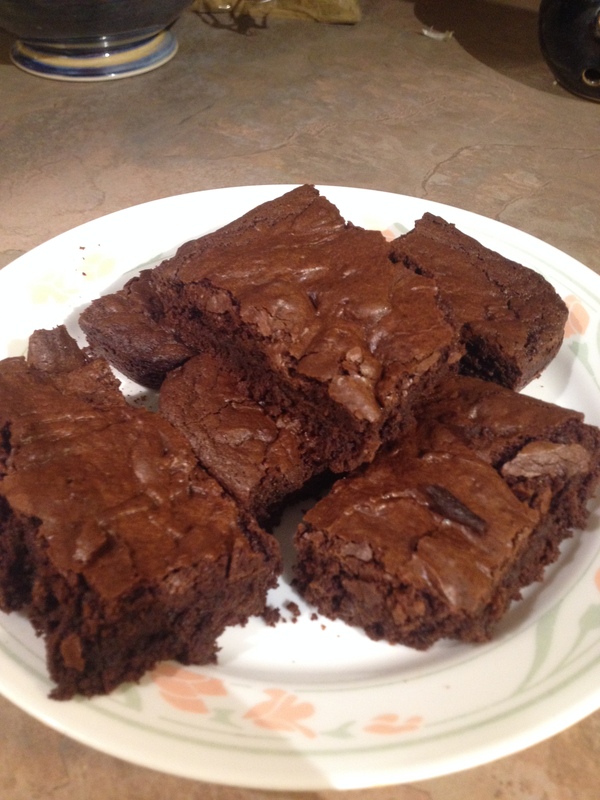 After much experimenting and tweaking, this is the brownie recipe I have come up with! . If you’ve never tried dill pickle soup, the whole concept may sound crazy to you. If you’ve tried it before, you will clearly understand why it makes my best of 2016 list. Give this one a chance! Another recipe that I think I have perfected. 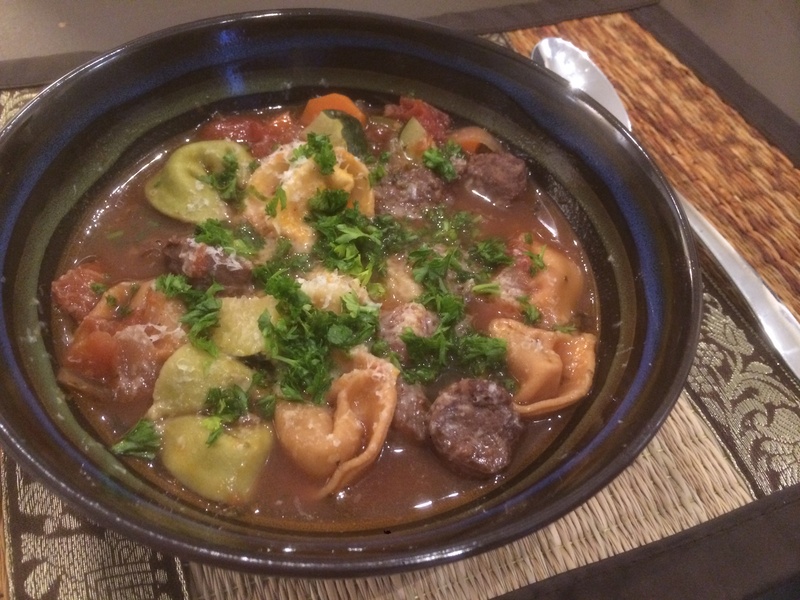 I have been making this recipe for years, and it warms my soul every time I eat it! So spicy and delicious. This is just a damn good soup. 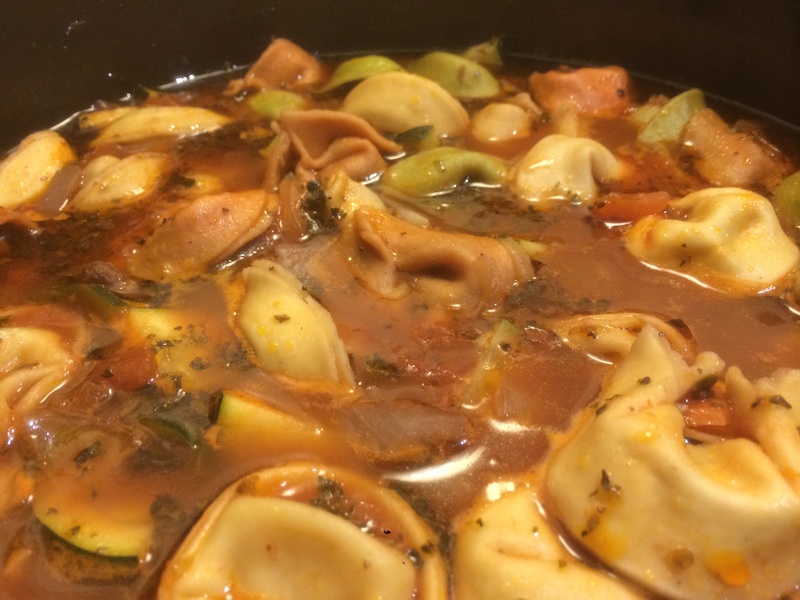 Hearty, meaty, carb-y, vegetable-y and a killer broth to boot. Try it out, you’ll see!